After a gap of 3 years we again exhibited at the COMMERCIAL VEHICLE SHOW which was held as usual in April at the NEC Birmingham. We took a ready made Shell stand covering 18 sq mts. 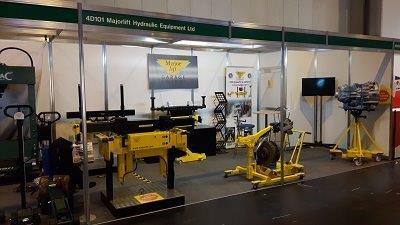 A full range of Majorlift products was exhibited. In addition to the products we had a TV programme running featuring company executives telling the Majorlift story. This attracted a lot of interest. To highlight our close association with Compac our stand was sited adjoining there’s, unusually without the mid stand wall. This move illustrated our close relationship with Compac. Our stand created a lot of interest in all our products but particularly the new 13 tonne pit jack specially designed for use in ATL inspection pits. Also shown for the first time at the show was the new, Majorlift 2 Tonne Vertical Transmission jack (VTJ2000) displayed with a ZF gearbox mounted on the top. This is a development of our long running and trusted 1 Tonne unit. Further interest was shown in the Hub caliper removal tool. At the end of the day it was concluded by all to have been a well worth while exercise.